After running onto the pitch following Liverpool’s dramatic winner against Everton on Sunday, Jurgen Klopp has been charged with misconduct by the FA. 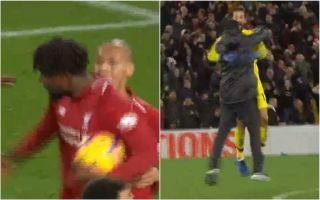 As seen in the video below, the German tactician was seen running onto the Anfield pitch after Divock Origi’s last-gasp winner over Everton, as he hugged Alisson before making his way back to the dugout. He later apologised in his post-match interview with Sky Sports, as seen below also, but ultimately it hasn’t been enough for him to escape a charge from the FA, as noted by ESPN. It’s added that he has until Thursday evening to respond to the misconduct charge, and so it remains to be seen if he faces any further action or not. Nevertheless, it’s likely to split opinion given some will argue that his raw passion should be commended and many others would perhaps have reacted similarly, while naturally, Everton fans and other neutrals will insist that it could be deemed as disrespectful given the circumstances. Either way, it clearly falls foul of the standards expected from the FA, albeit it was a crucial win for the Merseyside giants as it moved them back up to within two points of Premier League leaders Man City with 14 games played in what is turning out to be a fascinating title battle. “Look at Jurgen Klopp!” ? “This place has gone berserk!” ? Was the @LFC manager’s reaction to Divock Origi’s injury-time winner unacceptable?